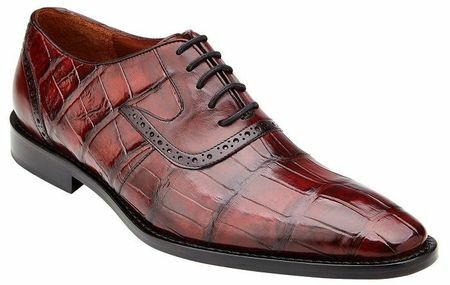 When you're shopping online for Belvedere Alligator Shoes for men in burgundy and nothing less than full alligator skin shoes will work, You're going to need Belvedere Shoes. The Walter is an Italian Style lace up dress shoe made of rich burgundy full Alligator Skin featuring a full buttery soft lambskin lining that is out of this world comfortable and hand shaped,stitched and nailed full leather sole and heel. You'll will be instantly hooked with these Belvedere Burgundy Alligator Shoes the moment you slip your feet into them. Questions You May Have Concerning Belvedere Black Crocodile Shoes. Question: Why do Crocodile Shoes cost so much? Answer: The quick answer to this question is supply and demand. Your basic marketing lesson 101. Crocodile cost more than most exotic skin shoes for the first reason and that is supply. Crocodile skin is one of the most rare exotic skins available that are used to be made into mens shoes even more so than most crocodile skins. You see crocodiles are closely and only so many are allowed to be killed each year for their prized skins to be made into high end luxury shoes like the Marcello from Belvedere. With so few skins allowed on the market, naturally the price for those priced crocodile skins will be extremely expensive indeed. Since the skins are so rare and expensive, shoe makers from Belvedere only allow their very best of the best shoe artisans to work with this pricey and rare exotic skin just because they simply cannot take the chance of any of the skin being ruined or unnecessarily wasted in production of the shoes. Question: Before I order these shoes online. How do I know what size to order? Answer: If you've bought Stacy Adams shoes, Giorgio Brutini shoes or even a pair of Florsheim shoes. You can be assured that the exotic and rare Belvedere crocodile shoes will run in the size exact standard shoe size in a Medium width. So, if you always buy a size 10.5 Stacy Adams dress shoe, you will know that a size 10.5 Belvedere shoe will also run to your size as well and surprise you with the luxurious comfort you feel the very moment you put them on. Now if you don't regularly wear dress shoes and live in Nike's on a regular basis. Just order online the full size down from what you wear in sneakers. If you wear a size 11 in Nike's, then you will need to order a size 10 in the crocodile shoes from Belvedere. Question: Are Crocodile shoes well made? Answer: Because of the very nature and rarity of exotic skin used to produce these kinds of shoes. There are simply no corners cut in the production and no inferior materials used when it comes to making shoes made of Crocodile. Besides the crocodile skin used in the upper part of the shoes, the rest of the shoes are entirely made of leather from the supple buttery lambskin that fully lined the entire interior of the shoes where your feet go to the fully hand carved leather soles and leather stacked heels with brass tacks making for a pair of shoes where compromise was not even a consideration. When you see shoes that cost dramatically less, you know that in order to meet certain retail price points there have to be all kinds of compromises made in order to meet the budget considerations that are needed. Question: Is there any special way to take care of a pair of Crocodile shoes? Answer: Me personally. I would take care of them like I would take care of a Ferrari. I would never get them dirty and keep them well polished at all times because why would you ever want any kind of dirt on them. You wouldn't now would you. I also would not want to wear them on days where the whether is not exactly pleasant not that the rain will hurt the crocodile skin but why waste a rainy day to show them off. Once I was finished wearing these exotic skin works of art, I would wipe them down thoroughly with a clean rag and store them right back in their flannel shoe bags that came with them in the box and first slip in some cedar shoe trees to absorb any of the interior moisture and keep them in the shape they are supposed to be in. If you don't already own some cedar shoe trees, I highly recommend getting some for your favorite shoes because they will really help keep your shoes looking their best for a very long time. Question: Can I resole these shoes when the time comes? Answer: Yes, Nile crocodile shoes by Belvedere can be resoled since they are entirely hand made but make sure that you only take your shoes to a fully competent shoe maker or repair shop that is capable of fully restoring your leather soles and heels to a new condition and not just slap some new leather on top of the old leather and then put some rubber heel where the hand stacked brass tacked leather heel used to go before. Remember the Ferrari reference earlier? You wouldn't bring your prized Ferrari to a Jiffy lube for an oil change would you. Of course, never. You would only bring it to a Ferrari dealership where they have mechanics who only work on these type of exotic machines. The same is true for bringing your pair of Belvedere shoes to a qualified and skilled shoe maker. If you know anyone who is shopping online for Cheap Suits, send them here.